Q: Can Non-Orthodox come to the services? A: Yes- everyone is welcome, whatever their beliefs or nationality. Q: Are the services in English? A: Yes- the services are almost solely in English, with the odd spattering of Slavonic, Greek or Romanian. Q: Why so many ikons? And why are people kissing them? A: The practice of painting and venerating holy images is an ancient one. In every Orthodox Church you will find ikons of Our Lord, His Most Holy Mother and holy people from all ages. Ikons are not portraits but depict spiritual reality. In kissing them, we show our love for those who are depicted. We venerate ikons while worship is reserved for God alone. Q: Do all female visitors have to wear headscarves? 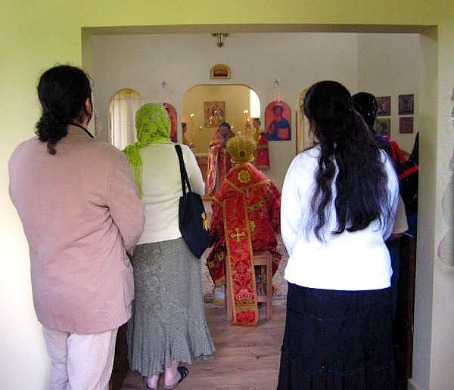 A: Although Orthodox women freely choose to cover their heads in obedience to Scripture (1 Cor 11:2-16) it is not compulsory for non-Orthodox female visitors to wear headscarves in order to participate in worship. Q: Why are most people standing? A: The normal position in the Orthodox Church is standing reverently because this is the most appropriate position to assume when in the presence of God. (Rev 7:9) Seating is available however, for the elderly and infirm. Q: Why have the clergy got their backs to me during the services? A: The clergy are not turned away from the congregation but - together with the people - face East and the “True Light”. Q: Why is there so much singing? A: Singing is a more beautiful form of human expression than mere speech, and therefore more appropriate for worship, as we always give the best that we can to God. Q: Can I join in? A: Yes. Although certain variable parts of the service are sung exclusively by the choir, many parts of the service should be sung by the whole congregation these include the “Lord have mercy” after each petition of the litanies, “Amen” at the end of each prayer, “and with thy spirit” after the priest blesses as well as the Creed and the Lord’s Prayer. If you would be interested in trying to sing more in the church services please approach the choir master Reader Mark. Q: Where is the confession box? A: Confession doesn’t take place in a box in the Orthodox Church. It is confidential but not hidden or anonymous. Q: What are the “Hours” read before the Liturgy? A: The Hours are the monastic prayers (offices) which are said at different times of the day, consisting mainly of psalms. We in parishes participate in them in so far as we are able, with the third and sixth hours before the Divine Liturgy on Sundays. Q: What are the little breads and name slips that are taken up to the altar in the service? A: Orthodox people write the names of the living and departed on the slips and hand them to a member of the clergy along with a small bread called a prosphora. In the altar the priest reads out each of the names of the living and departed and takes a particle out of the prosphora in remembrance of the departed souls. These particles are then consecrated along with the other Holy Gifts at the Liturgy. Q: Why is incense used so much? A: Incense represents prayers rising to God (Psalm 140). It is also appropriate that God’s house is beautiful in every way, including in its fragrance. Q: What is the Orthodox belief about the Eucharist? A: Orthodox hold that Christ’s Body and Blood are truly present in the Eucharist and that, through them, God nourishes us spiritually. (John 6:56). Q: Can anyone receive Holy Communion? A: Only baptised Orthodox Christian who have properly prepared through confession, the preparatory prayer and fasting from midnight may receive Holy Communion with the blessing of the priest. Q: Why is this administered on a spoon? Communion has been administered on a spoon since ancient times because this is the safest way of ensuring that it is easily consumed. Bread and hot wine are also taken immediately after communion to ensure that the Holy Gifts have been fully swallowed. Q: Why and how do babies and children receive Communion? A: Babies and children receive Communion because through baptism and chrismation (annointing with oil) they are full and equal members of the Body of Christ. Indeed, it is traditional for the youngest members of the congregation to receive first amongst people because they are purer and therefore more worthy. Q: Can I kiss the cross at the end of the service? A: Yes- if you feel moved to kiss the cross out of love and veneration then you are very welcome to do so and to take some blessed bread (antidoron) whether you are Orthodox or not. Q: What are the prayers read at the end of the service? A: Thanksgiving prayers for Communion are read after the service. If you have received Communion you should stay while they are read. Q: Is there someone I can talk to if I have any questions? A: You can talk to any member of the clergy, easily identified by the fact that they will be wearing a cassock. 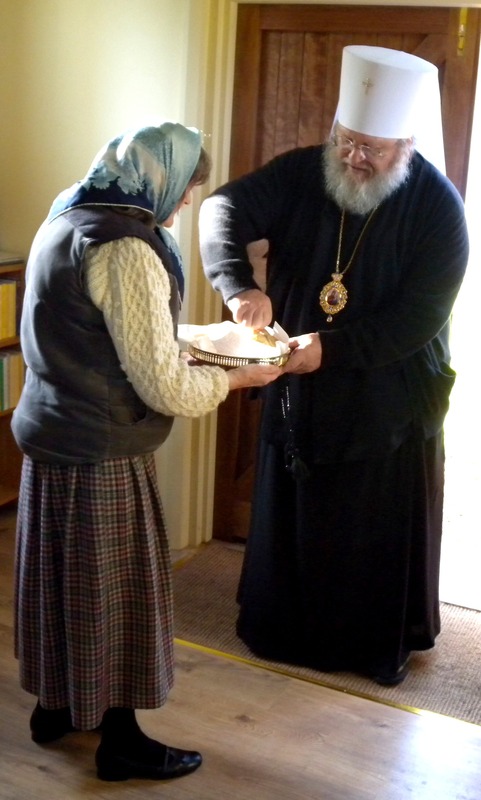 Metropolitan Hilarion is greeted by the foundress of our church, Mary Bond, or pious memory, in the traditional Russian custom with bread and salt.